Home Comics Looking at Marvel’s HUGE “Phase Three” Line-Up for the Marvel Cinematic Universe! Looking at Marvel’s HUGE “Phase Three” Line-Up for the Marvel Cinematic Universe! In Case You Missed It, quite the ANNOUNCEMENT was made by Marvel Entertainment recently, as the House of Ideas took to El Capitan Theater in Hollywood and held a “Marvel Event” that only fans could speculate and wonder as to what the true nature of this special gathering. Well ‘lo and behold, the people behind Marvel Studios practically dropped a bombshell, and announced not one, not two… But NINE MARVEL MOVIES that make up the next sequence of films that fall under “Phase Three” of the Marvel Cinematic Universe. If that’s a lot to take it, there’s GOOD REASON why and to be excited about it. Marvel Studios’ president and producer Kevin Feige was at hand to announce these new developments, leading to a legion of fans and news outlets getting all the nitty and gritty about what Marvel has in store for the next few years, which is just too awesome for simple words to describe. Speculated correctly by fans but thrown off by a deceptively joking Kevin Feige when he first revealed the title as “Captain America: Serpent Society“, the next Cap film directed once again by the returning Russo Brothers will indeed be called “Captain America: Civil War“, and is a title that pays homage to the 2006-2007 Marvel crossover event of the same name that saw the superhero community divided because of a registration act that required masked vigilantes to reveal their identities and be enlisted by the government. This storyline drove a wedge and caused friction between the Star-Spangled Avenger and his fellow Avenger Iron Man, with the armored hero championing the registration side while Cap rallied those who saw it as an invasion of one’s own civil liberties. With Robert Downey Jr. announced to appear as Tony Stark in this film, it seems he and Chris Evans’ Steve Rogers are in for the inevitable confrontation between two teammates and friends. The seeds of conflict were already planted and first seen in the first Avengers film when Stark’s Egotistical attitude clashed with Cap’s old-fashioned sense of duty, so it’ll likely escalate come Avengers: Age of Ultron next year and lead to that confirmed “roster change” that will befall Earth’s Mightiest Heroes at the end of that movie. The next film announced by Marvel is no surprise… The Sorcerer Supreme himself, Stephen Strange, is OFFICIALLY getting his own movie, and will be directed by horror film guru Scott Derrickson. While Benedict Cumberbatch has been reportedly in negotiations to sign up as the man to play the guy who mentions Vishanti, there’s no final word on that development yet. We’ll more eventually down the line as more news for these movies come up. Once dated for July 28, 2017, Marvel has officially moved James Gunn’s epic outerspace superhero sequel, Guardians of the Galaxy 2, to May 5, 2017! That means fans who enjoyed seeing Star-Lord, Gamora, Drax The Destroyer, Rocket Raccoon, and Groot will be able to see some more Awesome Mixes a littler earlier than expected, especially when there’s so much more Marvel films down the line to weed through too. Now replacing the date Guardians 2 was supposed to take, Thor: Ragnarok is THE storyline that most fans of the God of Thunder have been waiting for… And it doesn’t look pretty either. Taking place right AFTER whatever earth-shattering events Avengers: Age of Ultron has in store, this will be compounded by the fact that there’s a lingering plot thread carried over from the last Thor film… And that’s his mischievous step-brother Loki (Tom Hiddleston) posing as Odin and literally ruling Asgard without any objections whatsoever. So this will certainly be a dark path that Thor must traverse in his third solo film outing. And here’s the OTHER new property that has been officially announced and confirmed for the Marvel Cinematic Universe – T’Challa is getting his own solo film, giving life to the legend of the Black Panther! Cast in the famous and iconic role of the ruler of Wakanda is none other than Chadwick Boseman of Draft Day. Additionally, the character will first appear in Captain America: Civil War with Cap and Iron Man… And he’ll be clad in full costume altogether, which will look like… THIS. 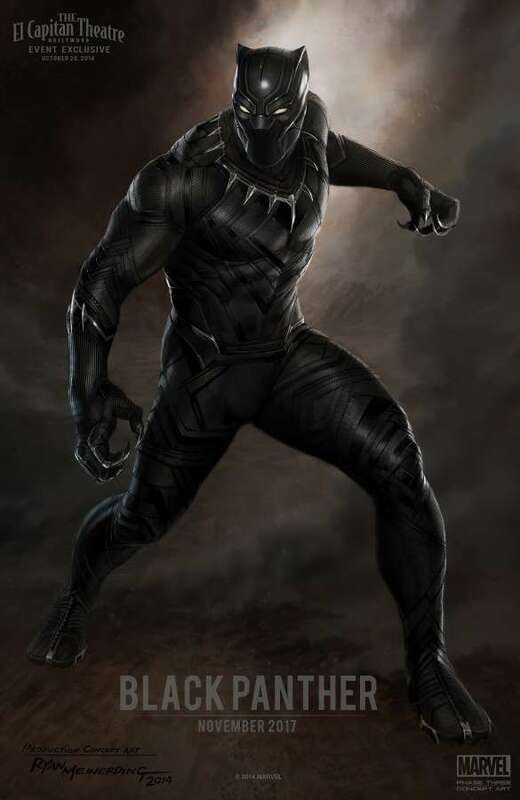 And that’s going to be a badass looking T’Challa when he suits up for his own solo flick on November 3, 2017! Marvel’s very own advanced species of superhumans are getting their own film! The Inhumans land in theaters on November 2, 2018. But wait, there’s something still missing, and that would be The Avengers themselves… Who will be getting a TWO-PART film that chronicles one of Marvel’s most popular comic events of yesteryear. That’s right… AVENGERS: INFINITY WAR IS SLATED FOR TWO PARTS ON MAY 4, 2018 AND MAY 3, 2019. 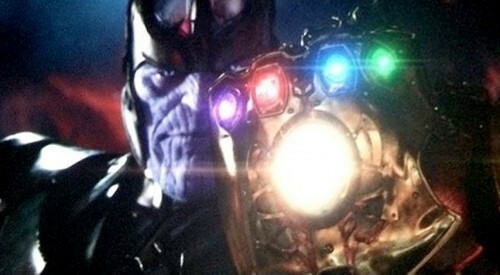 Based on the 90’s Infinity Saga that saw all the Marvel Universe battle Thanos because of the Infinity Stones and the Infinity Gauntlet, this will be the culmination of a grand plan the Marvel Cinematic Universe started with Phase One and when the Infinity Stones were introduced, thus setting the stage for a battle with the Mad Titan himself, who will be played by Josh Brolin. And in case you needed more teasing, here’s the Infinity War teaser shown at the Marvel Event uploaded in YouTube. That’s pretty much all there is to it… FOR NOW. MARVEL HAS LAID DOWN THE CARDS ALL THE WAY TO 2019.